Shop Our Favorite Boots From the Zappos 2018 Sale! We Found the Perfect Leopard Booties by Cole Haan and They’re Half Off! As much as we love a good bright sweater or coat here and there, we really do believe that a classic and stylish wardrobe is one that’s jam-packed with neutrals. A chunky black knit or a cute white kitten heel bootie will never go out of style, so we always end up coming back to them! After all, style staples need to be versatile and a cream, beige, black or white will never lead Us astray. Just like beauty is in the eye of the beholder, what constitutes a neutral is up to the wearer. While we can consider a taupe bootie a neutral, many can have trouble finding ways to incorporate it into their wardrobe. It’s not just single shades that can be a neutral, either — if you ask Us, a great leopard print is just as neutral as black, white, or any shade of brown. After all, leopard is comprised of an assortment of neutral hues — shades of brown, black, cream and sometimes gray — so why shouldn’t it be as easy to incorporate into your wardrobe as, say, a pair of black boots? Look, we get it: Leopard can be intimidating to someone that’s afraid of prints. It has a mixed reputation and we’ll be the first to say that too much of the animal print can get overwhelming very quickly. That shouldn’t be a reason to be afraid of it, however. Leopard pairs well with both muted and bright shades, plus it can easily become that little extra oomph your outfit needs! The easiest way to get a little bit spotty in our wardrobe is via a pair of boots! Luckily for Us, we found a great pair of booties for a discount to go wild over. See it: Check out the Cole Haan Arden Grand Bootie for 50 percent off the original price of $300, now $150 at Zappos! Not your style? Check out other leopard booties on sale at Zappos! The Cole Haan Arden Grand Bootie is the perfect way to gently introduce a touch of leopard to your shoe closet! They’re made with a soft suede upper, plus a side zip for easy slipping on and off. A rounded toe ensures you won’t ever feel like you’re walking on tiptoes or being squished, plus the padded footbed makes this bootie perfect for walking long distances, whether you’re traveling and exploring, or just running around your workplace. Unlike many leopard print booties that have a heel in a contrasting color, the chunky block heel is made of the same material as the outer part of the shoe, giving these a more luxurious vibe. It’s also only two and a half inches, so we’ll be comfortable wearing these all day (and night) long. Our absolute favorite part of the Cole Haan Arden Grand is hands-down the stunning gray shade. The “Mercer Ocelot” print is a more grey-toned take on the traditional leopard print bootie. Instead of chocolate brown spots, the boot is a study in greys, with a creamy grey base and spots in cool-toned dove grey and black outer rings. If the stunning ocelot print isn’t as inspiring to you as it is for us, the style is available in two other colors! There are a jet black pair and a delightful gray option that’s made of a beautiful smooth leather. Like the leopard pair, they’re the same color and material throughout the boot, which in our opinion, makes them look way more expensive. Surprise! They’re actually even less expensive than the printed style. 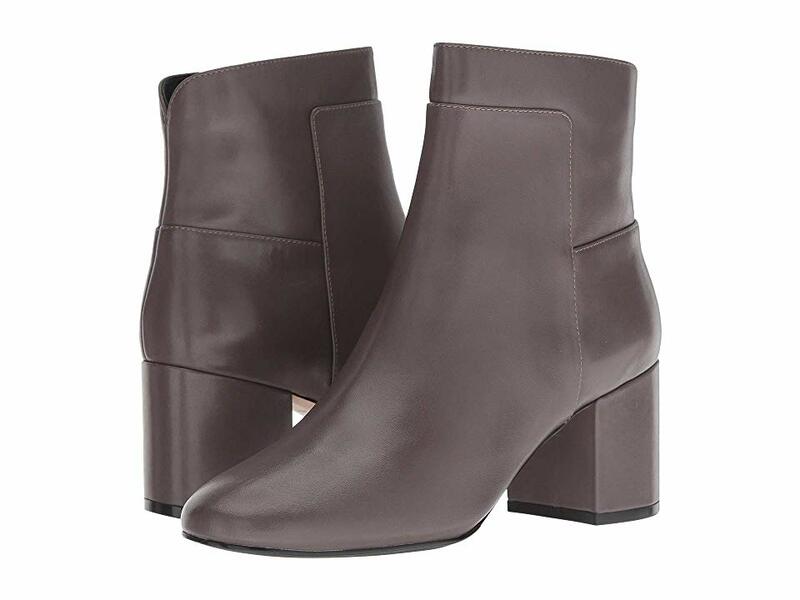 See it: Check out the Cole Haan Arden Grand Bootie for 50 percent off the original price of $280, now $140 at Zappos! Not your style? Check out other leopard booties on sale at Zappos! Reviewers love these boots just as much as we do! They have a perfect five-star rating, plus multiple shoppers say they garner so many compliments when worn! Some say they’re elegant and tailored and that they get plenty of attention! One even said that she wore her leopard print pair “to a party straight out of the box, stood all night and had no issues!” Sounds like a winner to us! Not sure how to style these? Don’t worry, we got plenty of inspiration to share! The black pair will look beautiful when worn with high-waisted, medium wash jeans and a black sweater, though they can just as easily be teamed with tights and a black minidress. The grey pair will certainly dress up any outfit, though we’re most excited to wear this with cream and light neutral shades. They can even tone down a fussy floral print! The leopard option, however, is the true star of the show. Wear them with an all-black outfit for a bit of added texture, or slip them on with skinny jeans and an off-the-shoulder top for the next date night! See it: Check out the Cole Haan Arden Grand Bootie for 50 percent off the original price of $300, now $150 at Zappos! Also be sure to take a look at the black and grey designs for just $140. Not your style? 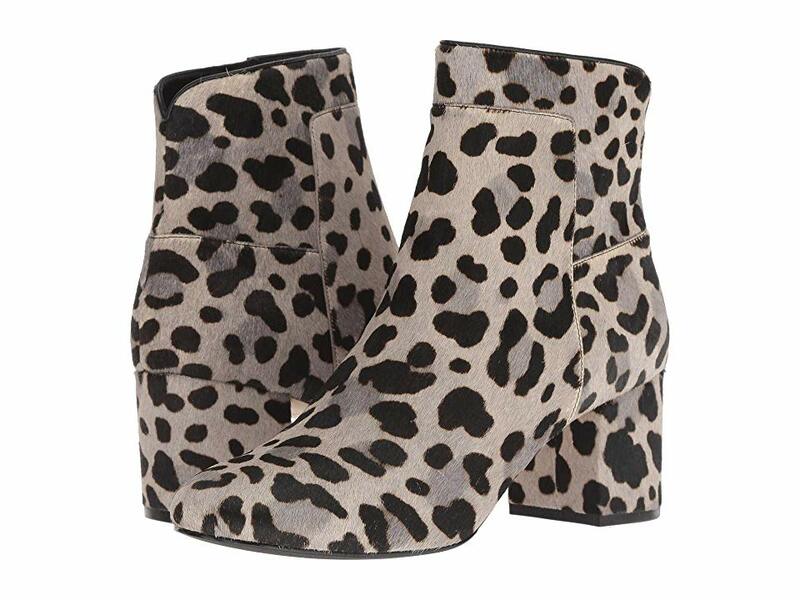 Check out other leopard booties on sale at Zappos!